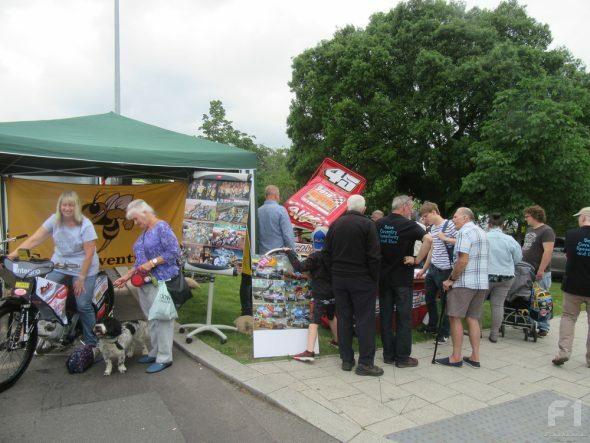 The “Save Coventry Speedway and Stox” campaign group had a display at the 2018 Coventry Motofest, held over the weekend of 2 & 3 June. 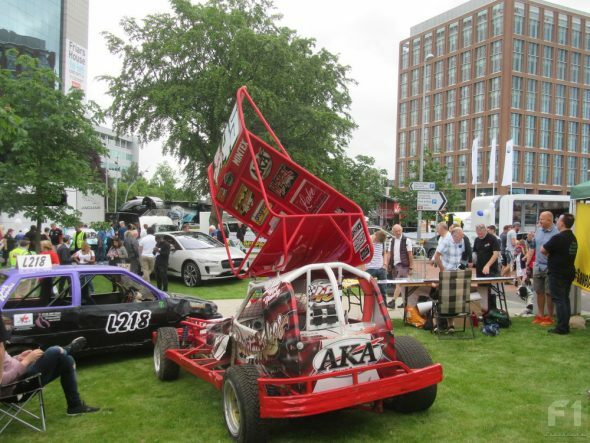 The stand featured Nigel Harrhy’s transporter and shale car, displays of Coventry speedway and stock car memorabilia and a couple of speedway bikes, one old and one from the modern day. I spoke to Wayne Roberts from the group to get an update on the stadium situation who told me that it is very much a case of waiting for Rugby Borough Council to give a decision on the planning application submitted by Brandon Estates (which is due June/July according to a comment on facebook). Wayne reminded me that of the 1800 submissions sent to RBC about the planning application only around 7 were not in favour of the stadium remaining and some of those 7 were more concerned about incursions by travellers if the site stayed untouched rather than supporting the housing plan. If RBC reject the planning application Brandon Estates will have to decide on their next course of action – presumably they could appeal or just sell the site to the highest bidder and move on to their next target. An offer has been made to replace all the doors and windows damaged since the stadium closed and there has also been an offer to replace the missing armco and purchase an air-fence if the site can be bought from BE. 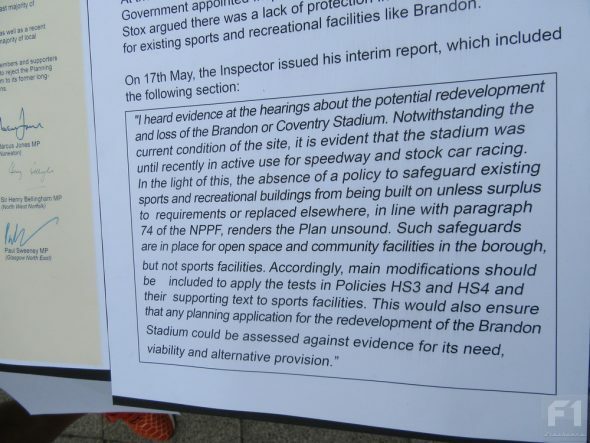 Apparently there have been a few enquiries about purchasing the stadium but whether this is from parties wishing to restore racing to Brandon or to use the site for other purposes is not known at present. What is known is that there is no shortage of willing hands prepared to put the old place back together if the much hoped-for correct conclusion is reached. I also spoke to Nigel later in the day who commented that when his family looked at buying Coventry Stadium in 1999 there was a restriction that the site could only be used for 39 days in the year which just does not make good business sense. For the stadium to continue I feel much more use should be made of the facilities – in the past RBC have rejected various such proposals – would they still have the same attitude if the place became a community asset? 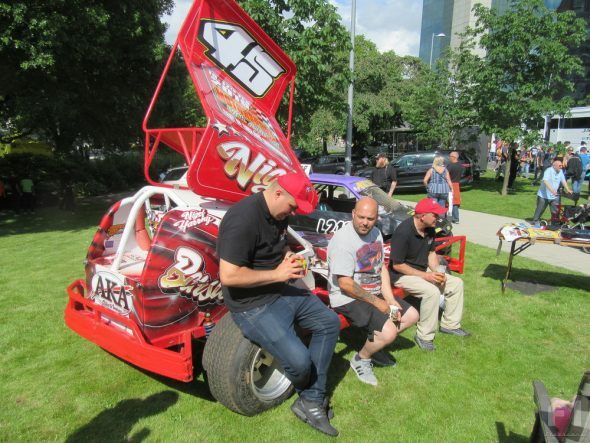 On the plus side there was a lot of interest in the 45 machine and the speedway bikes from visitors to the festival. The modern-day speedway bike had a device attached where you could test your clutch lever release reaction time. Needless to say I will not be applying to join a speedway team any time soon! In complete contrast to other cars on display which all seemed to carry “do not touch” signs, Nigel was positively encouraging people to climb into his stock car. I even climbed in myself at one point which was not easy and getting out was even worse. Speculation that it was a “roof-off” job however were unfounded. I had a wander around the city centre to look at the other cars on display and found a smattering of American muscle, the odd street rod of course lots of British classics. The owner of one such classic, an Austin A35 possibly, noticed my Coventry Stadium tee-shirt and we began chatting. It turned out he was the brother of Dave Muckian (416) and used to film stock cars at Coventry for JSD videos. 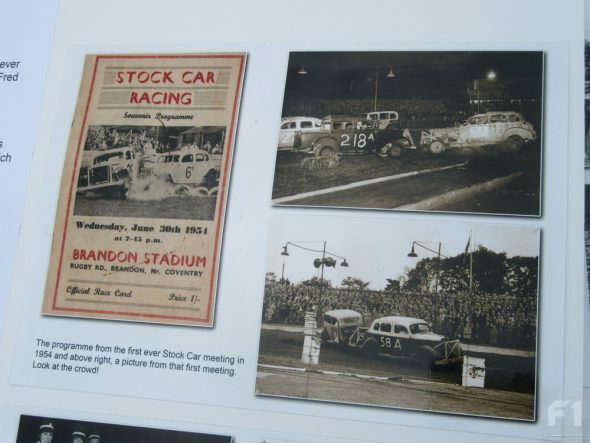 The chap handing out Motofest leaflets at the Action Arena (no stock cars sadly) told me his dad took him to Coventry Stadium when he was a lad and in later years he used to take his own children. He was keen to know where racing took place locally these days! The Save Coventry Speedway & Stox team are to be congratulated on giving up their weekend to get the word out to visitors to the Motofest. 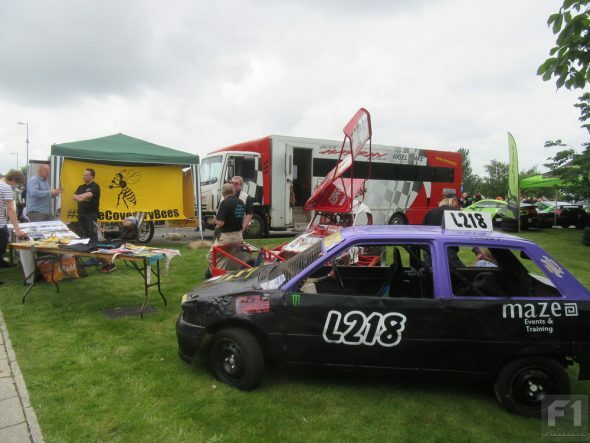 I would like to have seen more stock cars on display and I know Nigel was asking for more in the run-up to the show. 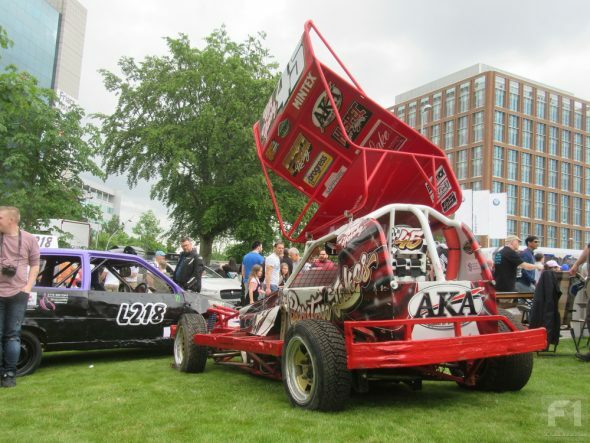 Talking of shows, flyers were also being handed out for the Motorsport with Attitude show scheduled for the Peterborough Arena early next year – for more details see Nigel’s shale wing!